Anatomy of the eye; two-panel drawing showing the outside and inside of the eye. The top panel shows the outside of the eye, including the eyelid, pupil, sclera, and iris. The bottom panel shows the inside of the eye, including the ciliary body, canal of Schlemm, cornea, lens, vitreous humor, retina, choroid, optic nerve, and lamina cribrosa. 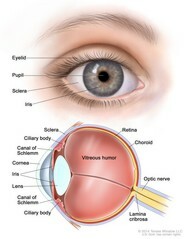 Anatomy of the eye showing the outside and inside of the eye, including the eyelid, pupil, sclera, iris, ciliary body, canal of Schlemm, cornea, lens, vitreous humor, retina, choroid, optic nerve, and lamina cribrosa. The vitreous humor is a gel that fills the center of the eye.